Investigation of Charges and Counter Charges Will Begin at Early Date and Will Be Exhaustive One. Affidavit Is Made Declaring Dictagraph Instrument Was Secured by Chief Lanford For Use in Phagan Case. Following close on the heels of the publication of the George M. Gentry affidavit, in which the young stenographer states that his typewritten report of the dictagraph conversation was padded, and says that he left town after he had discovered that he had fallen in with a “crowd of crooks,” comes the assurance that the grand jury will at once make a searching probe of the detective department in an effort to establish the truth regarding the many charges and counter charges that have been afloat since the dictagraph sensation was sprung. Members of the grand jury take the position that if the Gentry affidavit is true, it constitutes a stinging indictment of the detective department—an indictment which should not be allowed to stand longer than it will take to uncover the facts. Chief of Detectives Lanford defends his department and his own personal connection with the sensation with the declaration that the dictagraph reports, as published, were absolutely correct, and that reports to the contrary are not only false, but will be proved untrue. Impeiled by public sentiment the dictagraph incident created, it is authentically stated that the grand jury probe will be made at a very early date, and will be an exhaustive one. While contradicted by Gentry’s affidavit and statements from the trio of dictagraph “victims”—Mayor Woodward, Colonel Felder and Charles Jones. G. C. Febuary, secretary to Chief Lanford, stoutly maintas that the dictagraph notes were accurate and that there were no discrepancies whatever in the published copies. An affidavit setting forth the statement that Lanford obtained the dictagraph instrument on the pretense of using it only to corroborate evidence in the Mary Phagan mystery, has been attested to by L. O. Suries, who is attached to the Southern Bell Telephone company, and who is local representative of the dictagraph concern. L. O. Series Makes Affidavit. Georgia, Fulton County—Personally appeared before the undersigned, an officer authorized by Surles, who, first being duly and legally sworn, deposeth and saith: That he is an employee of the Southern Bell Telephone and Telegraph Company, and heretofore represented, as agent, the General Acoustics company. 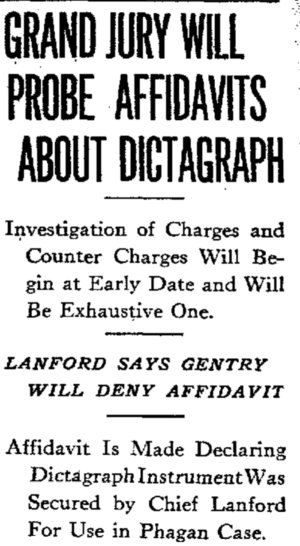 Deponent further says on oath that on Wednesday, the 31st day of May, 1913, Newport Lanford, chief of detectives, called him over the phone, requesting that he install a dictagraph in an important case, and that it must be done by 10:30 on the same morning Deponent thereupon at the office of Chief Lanford, who stated that he desired the dictagraph to corroborate important evidence in the Phagan murder mystery, whereupon deponent consented to install the dictagraph, upon the understanding that his name would not be used in connection with said installation. Chief Lanford assured deponent that he would comply with said request. Deponent was directed to certain rooms in the Williams house, where the dictagraph was installed under direction of one Febuary and one Colyar, who were understood by deponent to be representatives of Chief Lanford’s office, the installation being completed about 1 p.m. on Wednesday, the 21st day of May, 1913. After the installation deponent left the premises, and was called to remove the instrument on the following day. The removal was made about 5:30 p.m. on Thursday, the 22nd day of May, 1913. Deponent further states on oath that at no time during the interview with Chief Lanford, during the installation of said dictagraph or thereafter, was there any intimation that the instrument was to be used for corroborating evidence in the Phagan murder mystery. Deponent further states on oath that this affidavit was dictated by him personally and voluntarily, in order to clearly state his position in any controversy arising over his connection with said installation. Sworn to and subscribed before me, this 9th day of June, 1913. This affidavit has inspired Colonel Felder to draw a parallel of extracts from one of his statements recently published and from a reply made by Chief Lanford. He accuses the detectives of having lied regarding the negotiations with Surles prior to the installation of the dictagraph. That every effort will be made by the detective department to return Gentry to Atlanta, was a statement made by Lanford. If any legal means can be found, he said, and the stenographer refuses to come back to Georgia, he will be brought back under charges of perjury. Chief Beavers, who is in Washington attending the annual convention of national police heads, has been wired by the detective chief to find Gentry and investigate his affidavit. No reply was received from him up to late last night. He was also asked to persuade Gentry to return with him to Atlanta. Febuary stated to a reporter that he will swear to the accuracy of the published dictagraph reports, and that if Gentry persists in his purported story, he will personally take action against the stenographer for alleged perjury. He says the affidavit is the result of a frame-up of the ‘ring,’ who were affected by the dictagraph incident. George Gentry’s mother, when seen by a Constitution reporter at her home last night, would not discuss the report that she had sworn to an affidavit, which stated that her son, shortly before his departure from the city, had told her of the dictagraph ‘padding,’ and had given as the reason for his flight the fear of being arrested on a rumored warrant. Mrs. Gentry said that she did not care to tell the date on which she expected the stenographer’s return. She explained that it was his affair, not his family’s, and that this was the reason why they were maintaining silence.